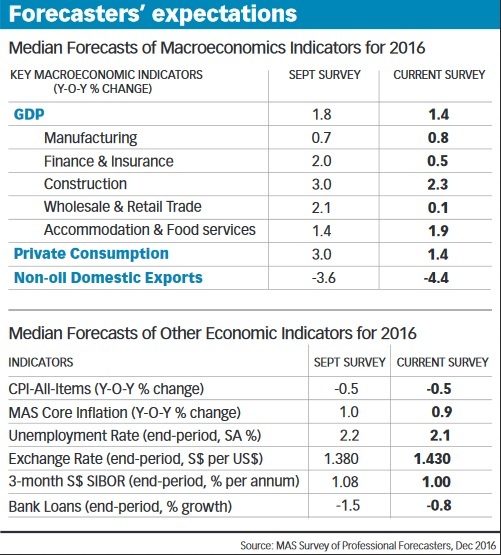 For the sixth consecutive time, private-sector economists have cut Singapore's 2016 growth forecast - this time to just 1.4 per cent. They have also trimmed 2017's projection to 1.5 per cent, evaporating any hopes for a marked improvement next year. Both estimates are within the official forecast ranges of 1 to 1.5 per cent in 2016, and 1 to 3 per cent in 2017. According to the Monetary Authority of Singapore's (MAS) Survey of Professional Forecasters, analysts now see softer expansion in the services sector, as well as in private consumption. UOB economist Francis Tan told The Business Times: "People are just expecting the growth rate to muddle through. It doesn't help that everyone thinks private consumption is going to be lower at 1.4 per cent (compared to an earlier estimate of 3 per cent)." Indeed, in the September survey, analysts had projected this year's gross domestic product (GDP) to expand 1.8 per cent - already a step down from previous estimates of 1.9 per cent and 2.2. per cent. The softer 2016 median forecast pencils in far worse showings in the finance & insurance and wholesale & retail trade sectors. These are expected to expand 0.5 per cent and 0.1 per cent respectively, versus earlier projections of 2 per cent and 2.1 per cent. In addition to a weaker and more uncertain global economic environment, Mr Tan thinks the downward revisions reflect the bleakness surrounding Singapore's labour market. On Tuesday, third quarter data from the Ministry of Manpower showed a decline in employment, a rise in resident long-term unemployment, high layoffs, and a widening gap between job seekers and vacancies. "With lower wage gains and people getting retrenched, consumption isn't going to be strong. On the flip side, there are expectations of rising interest costs. So there are two headwinds that will make people a lot more cautious with their spending patterns," said Mr Tan. Credit Suisse economist Michael Wan agreed: "Going forward, there might be some benefits from stronger global growth, but the weakness in domestic demand will dominate it in Singapore . . . Households and corporates will still remain quite stretched given what we've seen on the interest rate front." Services aside, economists expect this year's manufacturing growth to stand at 0.8 per cent - similar to the 0.7 per cent estimated previously. Inflation forecasts also remain stable. Headline inflation is still projected to come in at -0.5 per cent, while core inflation is estimated at 0.9 per cent (versus 1 per cent earlier). Core inflation strips out the costs of accommodation and private road transport. Going by the median forecasts of quarterly GDP growth in 2017, private-sector economists think growth will pick up marginally - from 0.8 per cent in Q4 2016 to 1.3 per cent, 1.4 per cent, 1.7 per cent, and 1.8 per cent in Q1, Q2, Q3, and Q4 2017, respectively. Still, Mr Wan thinks the 1.5 per cent 2017 growth projection is too optimistic. He expects the economy to expand just 1.1 per cent next year, given his view that domestic demand will remain lacklustre. Last week, Nomura cut its 2017 GDP forecast for Singapore to 0.7 per cent from 1 per cent - well below the official range of 1 to 3 per cent. "We find it hard to share the government's optimism on the growth outlook, as Singapore's ultra-open economy and financial centre will likely be one of the most exposed in Asia to the UK leaving the European Union, the threat of trade protectionism from the US and political risks in Europe," said Nomura in a report. It also cited the high levels of household and corporate leverage, and weakening labour market conditions.